Birchsong: Poetry Centered in Vermont, vol. II, a new anthology of 111 contemporary poems by 67 Vermont poets, has been published by The Blueline Press in East Dorset. 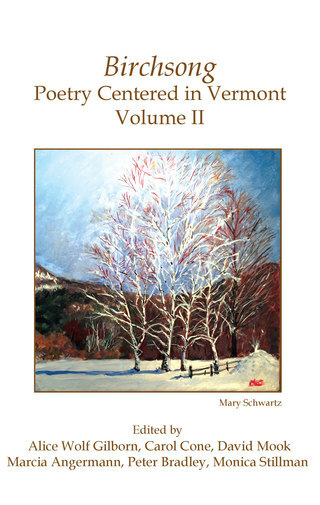 Illustrated by artist Mary Schwartz from the same town, the book is a rich collection of poetry reflecting the Vermont landscape, its people and its culture. In the six years since the first Birchsong volume, which appeared in 2012 following tropical storm Irene in 2011, there have been changes to the Vermont countryside and in the way of life here, yet the constants that endure throughout the cycle of years and seasons will be recognized by all who revere the natural world. "The poets represented in this volume [one] are all attuned to nature and its meanings for our lives. The variety of forms, tone, perspective, and subjects weave a fascinating tapestry," wrote Anthony O. Tyler, former editor of Blueline. The second volume (2018) is edited by Northshire Poets Alice Wolf Gilborn, Carol Cone, David Mook, Marcia Angermann, Peter Bradley and Monica Stillman. The Blueline Press, licensed in Vermont, was established by Gilborn mainly as a reprint press, though it has published original works on occasion, including the first Birchsong. Birchsong: Poetry Centered in Vermont, vol. II, is now available from the Northshire Bookstore:https://www.northshire.com or by emailing thebluelinepressvt16@gmail.com.